Letters page, Mail and Guardian, Johannesburg, 12 July 1996. 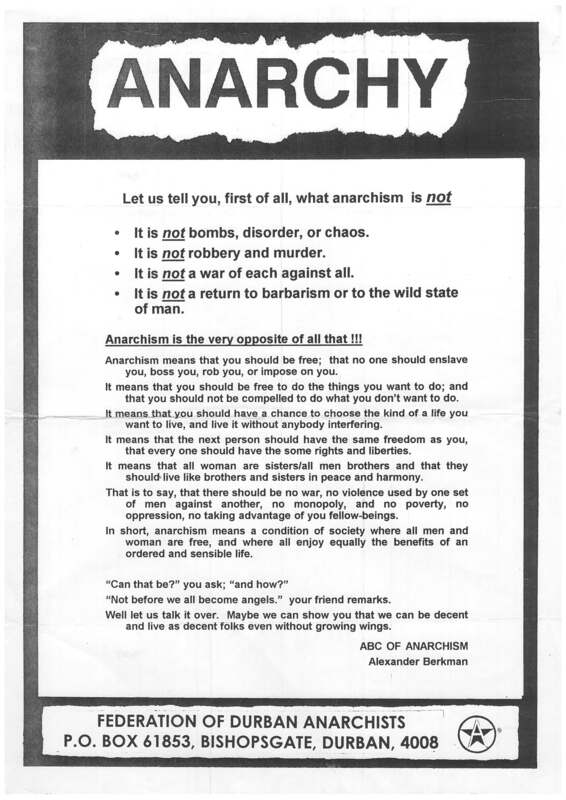 Letter by member of Durban Anarchist Federation, who had visited the Zapatista zone in Chiapas. Note: the Durban Anarchist Federation, which went through various names and in 1997 largely merged into the Workers Solidarity Federation. Activists from the Durban Anarchist Federation also set up what is today Zabalaza Books, a South African anarchist publishing project that continues today as part of the Zabalaza Anarchist Communist Front milieu. I WAS pleasantly surprised by the unusual editorial subtlety which linked the crisis of conscience South African organised labour is experiencing with the refreshing innovations being forged by the Zapatista movement in southern Mexico (June 28 to July 4). It was obvious long before 1994 that Cosatu’s biggest looming battle would revolve around the inherent paradox of their erstwhile ANC/SACP equals becoming their masters under a democratic dispensation. The greatest genuine threat to ANC dominance will come from within its own ranks, perhaps a new, radical workers’ movement grown out of Cosatu. In February this year, I paid a month-long fact- finding visit to Chiapas and the Guatemalan highlands. The Zapatistas understand that the only ones who can free the people are the people themselves, not some kind of elite, dictatorial vanguard, whether state-capitalist (communist) or private-capitalist. Unlike most liberation movements, they have retained their sense of humour and humanity and bucked tradition by having an unusually high number of women in combat commands. Also, there are many similarities between their experience and ours.